Definition Location of the superior attachment of the pinna. Note: the size and rotation of the external ear are not relevant. Landmarks Four methods to determine the position of attachment of the ear are outlined. 1. Draw an imaginary line between the outer canthus of the eye and the most prominent part of the occiput. The superior attachment of the pinna should be on or above this line (Fig. 7.62a). 2. Draw an imaginary line through the inner and outer canthi and extend that line posteriorly. The superior attachment of the pinna should lie on or above that line (Fig. 7.62b). 3. Draw an imaginary line between both inner canthi and extend that line posteriorly. The superior attachment of the pinna should lie on or above that line (Fig. 7.62c). 4. Anthropologists determine the position of the ear according to a proposal by Leiber. The highest point on the upper margin of the cutaneous auditory meatus (porion) is the landmark used to determine position, rather than the superior attachment of the pinna. A profile line that touches the glabella and the most protruding point of the upper lip is imagined. A straight line is drawn from the porion to meet this profile line at 90 degrees (Fig. 7.62d). The area of the face between the free margin of the lower eyelid and the upper edge of the nasal ala must be crossed by the line drawn from the ear canal if it is to be considered at normal level. 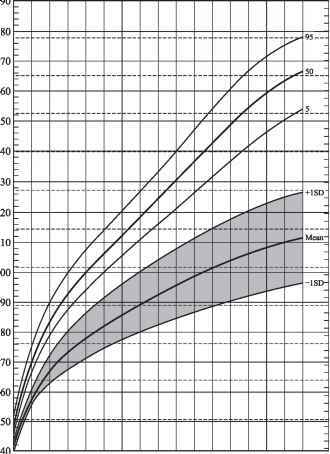 In a highset ear, this line meets the profile line above the free margin of the lower eyelid, and in a low-set ear, this line meets the profile line below the upper edge of the nasal ala.
Instruments A tape-mesure, flexible transparent ruler, or graduated piece of X-ray film can be used to define the horizontal plane for the first three methods outlined above. For Leiber's method, a special instrument that can be held along the facial profile line has a perpendicular arm that can be moved up and down until it touches the porion. Position The head should be held erect with eyes facing forward. Remarks The landmarks used to determine ear position are among the most controversial in clinical dysmorphology. None of them is perfect, and the reader is advised to become acquainted with one method that is comfortable and to use this method constantly. Although we prefer to use the superior attachment of the pinna as a landmark, other clinical dysmorphologists and anthropologists may assess ear position based on the level of the porion. Photographs are useful to assess ear position only if all landmarks are shown. 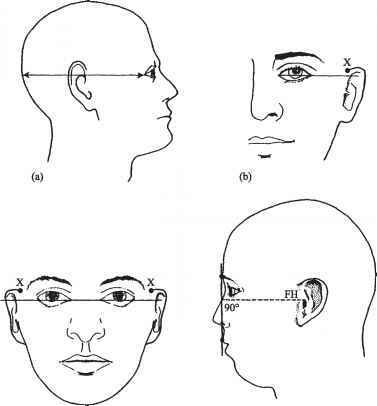 Figure 7.62(a-d) Methods of measuring ear position. view, the ears are subject to parallax. If the neck is extended, they appear low. If it is flexed, they seem high. In the lateral view, ear position seems to be judged in relation to the vertex above, and the chin and level of the tip of the shoulder below. A high ratio between these distances gives the impression of low-set ears. This may explain why the ears of a small infant appear to be set lower than those of an older child. The infant's neck and mandible are relatively small compared to the cranium. The inclination of the auricle also affects the observer's impression of ear level. The ears book lower set when the auricles are tilted posteriorly. For this reason, ear length and position should be validated by quantitative criteria such as those outlined above. What is the name of the imaginary line drawn between the outer canthus of the eye and the E.A.M.? Why should the upper ear should be in line with outer canthus? How should ears be positioned on the head?